Intuitive navigation, workflow-driven process and chat mode interface allowing greater focus on each question. Leverage the roll-forward capabilities to easily identify changes in questions and responses from prior period. Assign questions to individual users and track their progress. Use filter functionality to review key areas or questions within the checklist. Real time updates provide the better collaboration between EY and client teams. Familiarize yourself with the solution by reviewing enablement materials available in EY Atlas. Share the enabler below with your client, discuss the benefits of using the solution and sign them up to complete the checklist. If your client is completing the checklist, add them to the EY Client Portal (if not already added) and as an External Team member to your EY Canvas engagement. 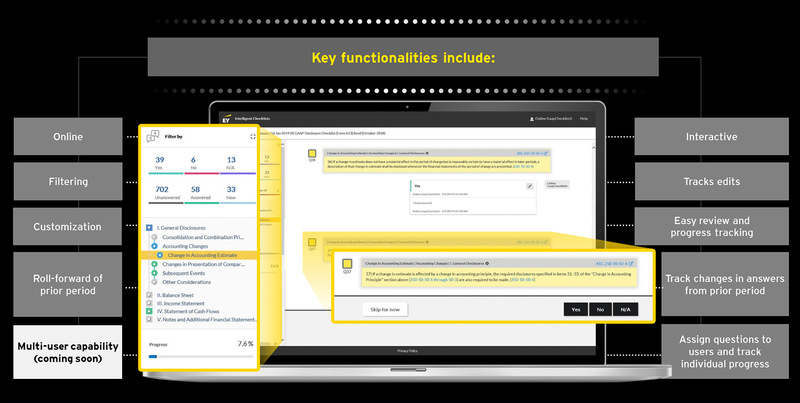 Access Automation hub from the “More” menu in your EY Canvas engagement, set-up the checklist and invite your client (if applicable). EY Intelligent Checklists is currently available for clients at no additional costs. However, only clients with EY Atlas Client Edition subscriptions will have access to the respective authoritative literature.